A series like this is a rare glimpse into the various iterations in design and process that Kenner went through back in the mid-1980's. The pieces shown here were accumulated over a period of several years from different sources. 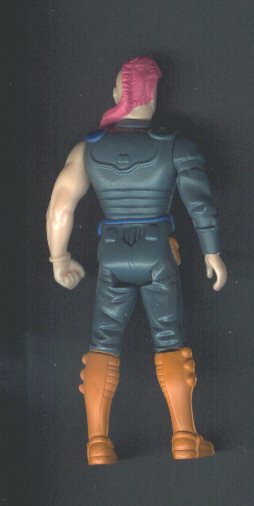 Each has it's own part in the creation of the Thall Joben action figure. 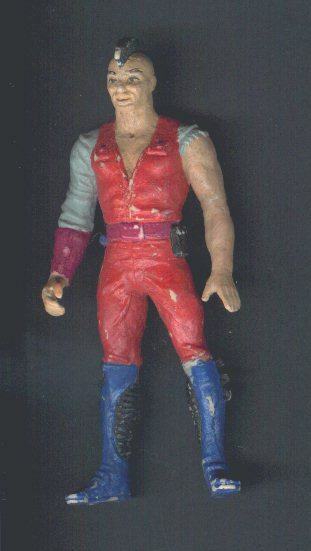 This first figure is a very early conceptual piece and bears only slight resemblance to the standard action figure. 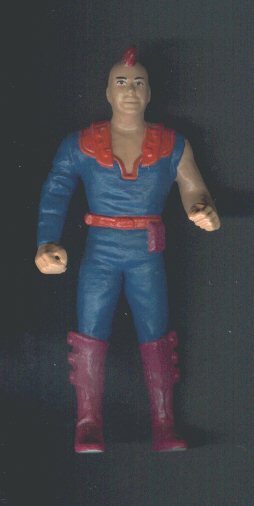 This statuette is really a painted wax sculpting and was probably used just to get an idea of what Kenner was looking to accomplish with the character. Many of the features evolved into the final figure, but some features were changed or abandoned. The paint scheme is one thing that was radically changed. 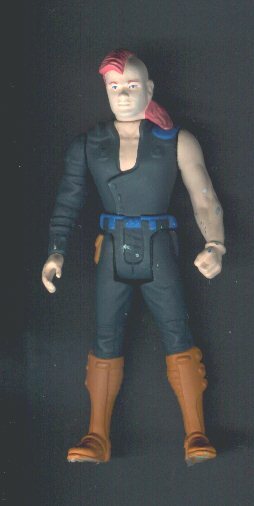 I have no idea if this design and it's coloring was the result of Lucasfilm approval or if it was just Kenner throwing ideas around. The sculpting is very rough and it appears that no copies of this piece were ever made. 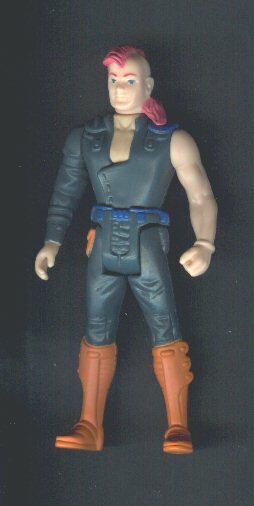 This figure measures in at 4 1/2" tall, but I doubt Kenner was thinking of changing the scale of the figures at this stage of the game. It was most likely this big because it was easier to work with. This second figure is a painted hardcopy what appears to be the second iteration in design. This one-piece design was much cleaner than the first stage piece, but it's still quite different from the production figure. The mohawk, as on the first conceptual piece, is straight. Later on it would take on a longer, more wavy style. The paint scheme is still very different from the production figure. Unfortunately I'm missing at least one step before this one and that's the original sculpting for the standard figure. Shown here is a painted hardcopy of the figure as it would appear for sale to the public. As with all figure hardcopies, the appendages are pinned in place and removable. The figure is totally handmade and hand painted. Once the tooling is created, injection molded figures can then be produced. Here is an unpainted first shot molded in odd colors. It is typical for some of the first pieces out of the mold to be made in weird colors because they would be made using whatever colors were in the machines at the time. The head and left arm are the only parts that would eventually be molded in flesh-tone color. In production the torso, legs, and right arm would be molded in blue plastic and painted accordingly. This piece has a nifty black torso. This is really the last step in the process. The only difference between this figure and a production figure is that it has no dates on it's legs which is why it's shown backwards. In all other respects it is exactly like a production piece in how it's made and how it looks and functions. Once this final figure is approved the copyright dates are put into the mold and the figure is ready for production.